The definition of a hammock is a canvas or rope bed that is hung between two trees or other supports. A bed that is hung between two palm trees that you lounge in outside in your backyard or when you are on vacation is an example of a hammock. "hammock." YourDictionary, n.d. Web. 09 April 2019. <https://www.yourdictionary.com/hammock>. A hanging, easily swung length of canvas or heavy netting suspended between two trees or other supports and used as a seat or bed. A tract of forested land that rises above an adjacent marsh in the southern United States. A swinging couch or bed, usually made of netting or canvas about six feet wide, suspended by clews or cords at the ends. (US, archaic) A piece of land thickly wooded, and usually covered with bushes and vines. Relaxation Gifts: Retirement is an era of relaxation and gifts such as a hammock, pillow, reclining deck chair, luxury robe, slippers or spa treatments help new retirees indulge right from the onset of their retirement. 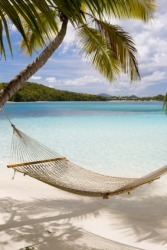 The hammock was universal in the tropics, and chairs of wood or stone. We sat in the hammock; but there was no rest for the weary there. Danh-gbi has numerous wives, who until 1857 took part in a public procession from which the profane crowd was excluded; a python was carried round the town in a hammock, perhaps as a ceremony for the expulsion of evils.